The following is a review of the supplement Purely Stacked Pure Mental Focus. The claims of this product are that it improves clarity, focus and alertness while also enhancing concentration, motivation and mood. Pure Mental Focus is also intended to reduce fatigue, procrastination, mental health decline and brain fog without the use of caffeine or other stimulants. Continue reading for the ingredients contained in this product and discover if these claims are true. Blood flow is enhanced by Ginkgo Biloba, which improves cognitive function and aids memory. DMAE is intended to raise the rate of production of acetylcholine within the brain, which is meant to boost concentration. L-Tyrosine affects alertness and motivation through neurotransmitters of which it is a necessary part of their production. Taurine is an antioxidant that protects neurons as well as helping in osmoregulation in cells. This is not manufactured with gluten so it is suitable for those who are gluten intolerant. The capsules are composed of cellulose making the product vegetarian. Although a serving is described as two capsules on the product label the suggested use on the back of the bottle recommends that one to two capsules be taken in between meals on an empty stomach once or twice a day. Pure Mental Focus has no side effects listed, which is perturbing as there should be some. Pregnant and lactating women, those taking medications or with a medical condition should consult with their physician before taking the supplement. 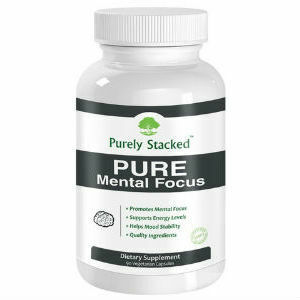 Purely Stacked sells Pure Mental Focus in 45-capsule bottles for $49.99. It’s currently on sale but when it’s at full price, it costs $59.99. At the time of this review, the product was sold out. The price per capsule would be $1.11 or $1.33 at the reduced price and full price respectively. Purely Stacked does not offer a guarantee for Pure Mental Focus or any of their other products. If they do have a guarantee, it is not clearly outlined anywhere. In terms of reviews, there is only one to be found on Purely Stacked’s website, which was positive. This does not give an accurate indication of how the product was received. However, the fact that the product has sold out is a sign of the supplement’s popularity. This could attest to its effectiveness as well. Pure Mental Focus seems to be a strong product judging by the amount of each active ingredient and the relatively low dosage. It is likely an effective product because of this and this would explain its popularity and why it was sold out at the time of review. Additionally, Pure Mental Focus is suitable for celiacs and vegetarians. However, the supplement may be unsuitable for those allergic to soy although this is unclear. Another downside of the product is its price. The capsules cost more than $1 apiece, which is higher than some similar products available. Pure Mental Focus also lacks a guarantee so that if you are dissatisfied with the product, there is nothing you can do about it. There is a possibility that your needs will not be met by this supplement. Henry Costa	reviewed Purely Stacked Pure Mental Focus	on November 19th	 and gave it a rating of 2.5.